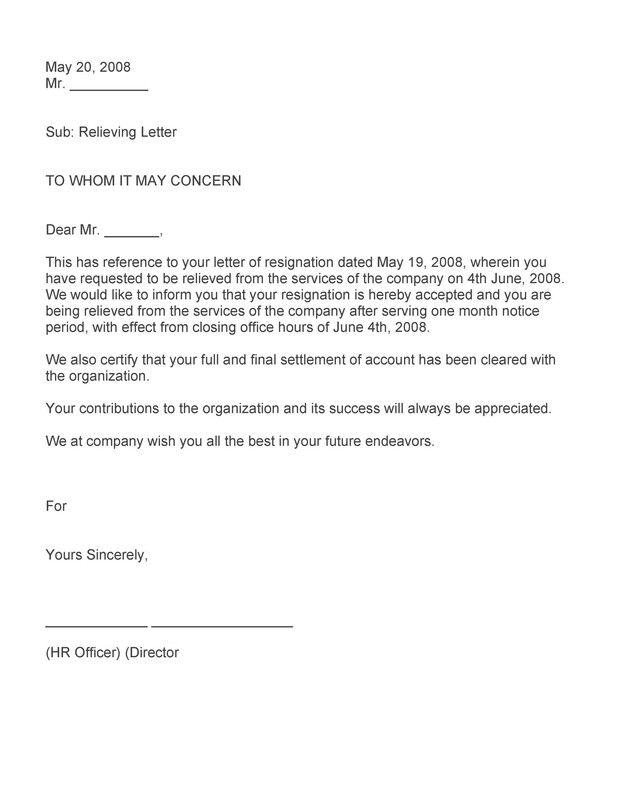 The HR department of a company issues a relieving letter to employees who have formally resigned. 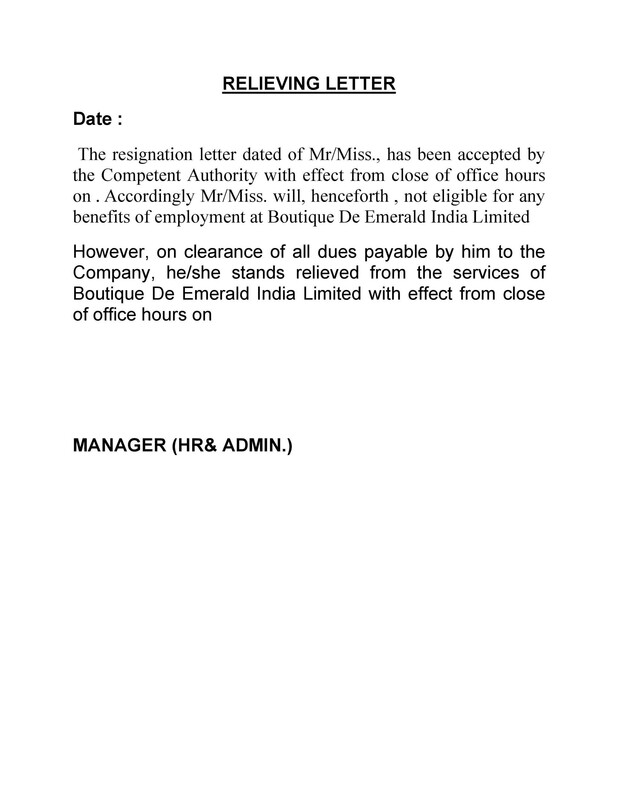 This letter is the way for the company to formally acknowledge the acceptance of the employee’s resignation. 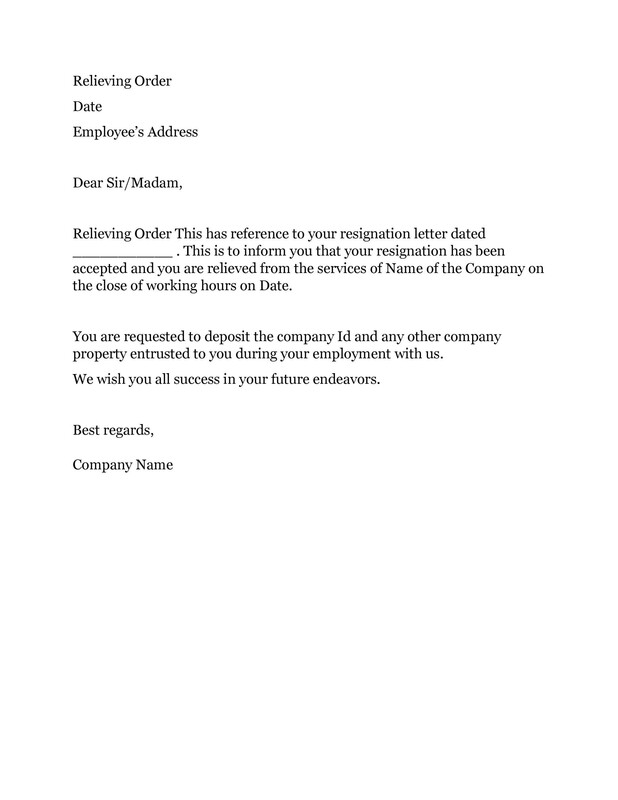 This is a type of business letter which contains details about the employee’s last working day with the company and states that he is being released from duties without any issue. 7 When should you receive a relieving letter? 9 What happens when you don’t receive a relieving letter? 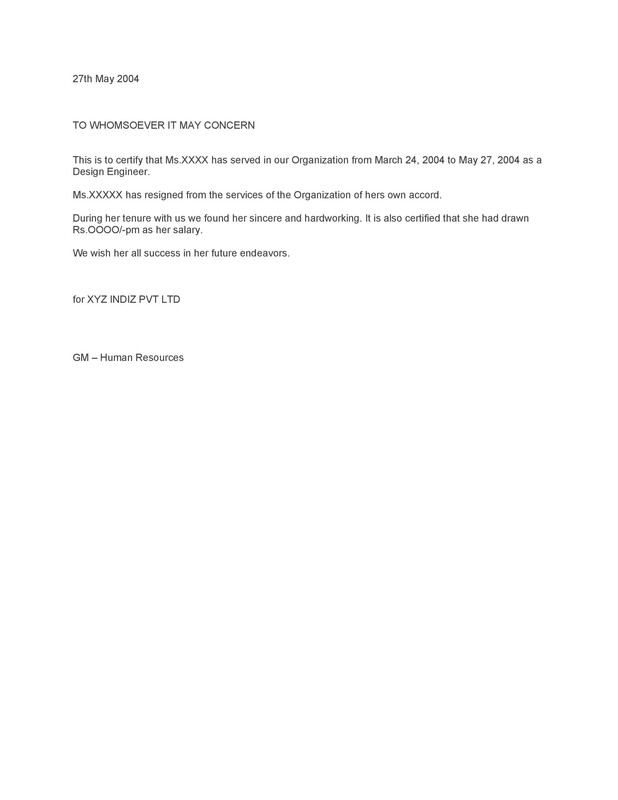 When the company issues a relieving letter, they do so for a specific purpose. 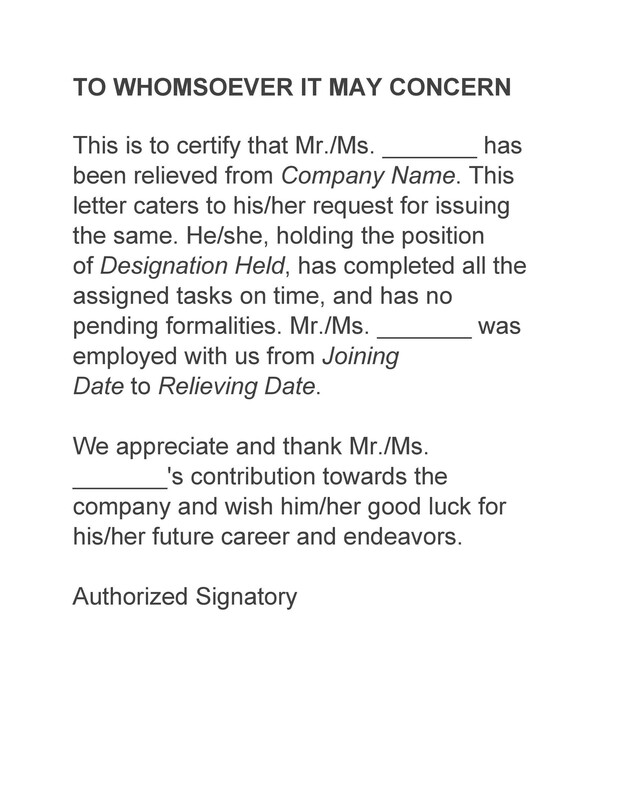 Simply put, a relieving letter template serves as documented proof that the employee already fulfilled all of his responsibilities in the company as he held his position during a specific time frame. If you see any relieving letter sample, you’ll know how significant it is. 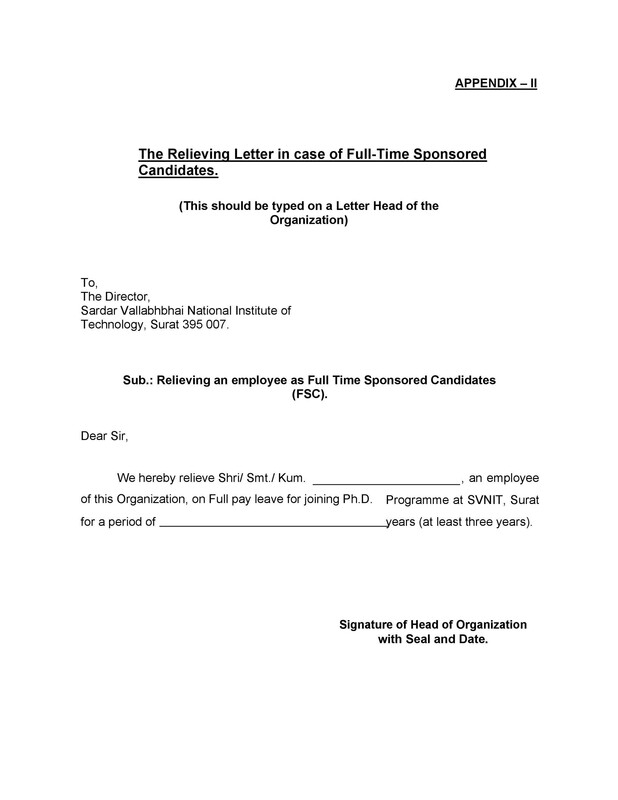 You need this letter in case your new employer asks for proof of the time you’ve spent in your previous company. Without the letter, most companies might not even take you seriously. 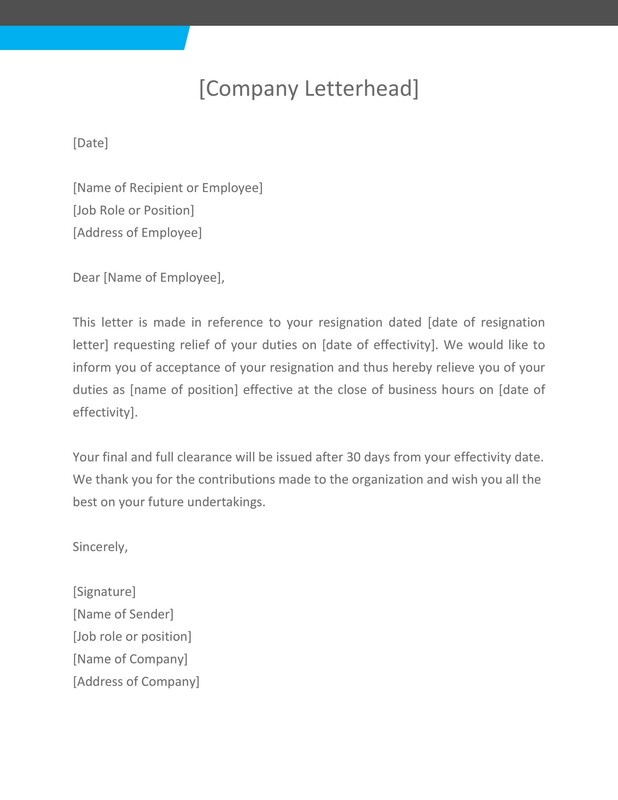 If you plan to resign from your current company, then you must acquire a proper relieving letter format before you completely cut ties. 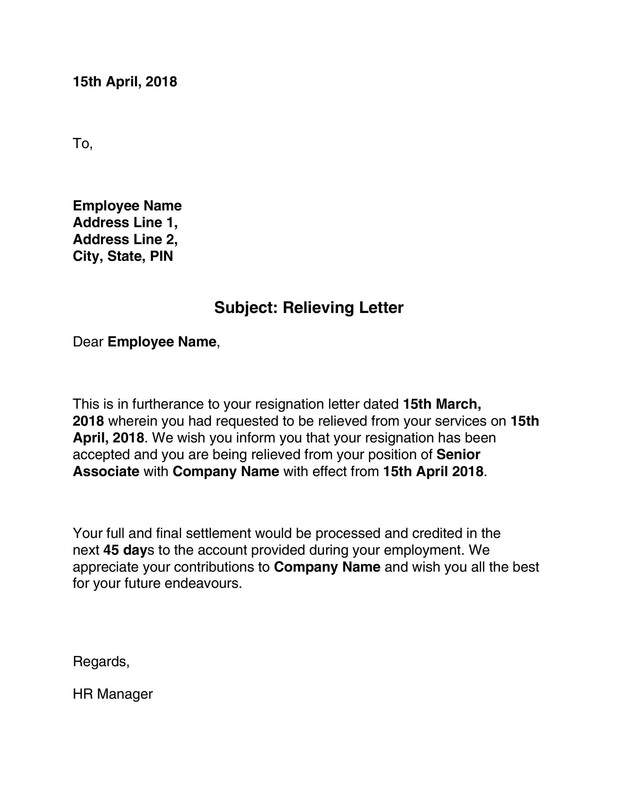 The main purpose of this letter is to provide anyone who asks for physical evidence that the company has officially relieved you from your responsibilities. In most cases, new employers would ask you to provide a relieving letter to verify all of the information you’ve given to them in your resume. For instance, they may want to check the job title you claimed you held or the date when you officially resigned from the company. 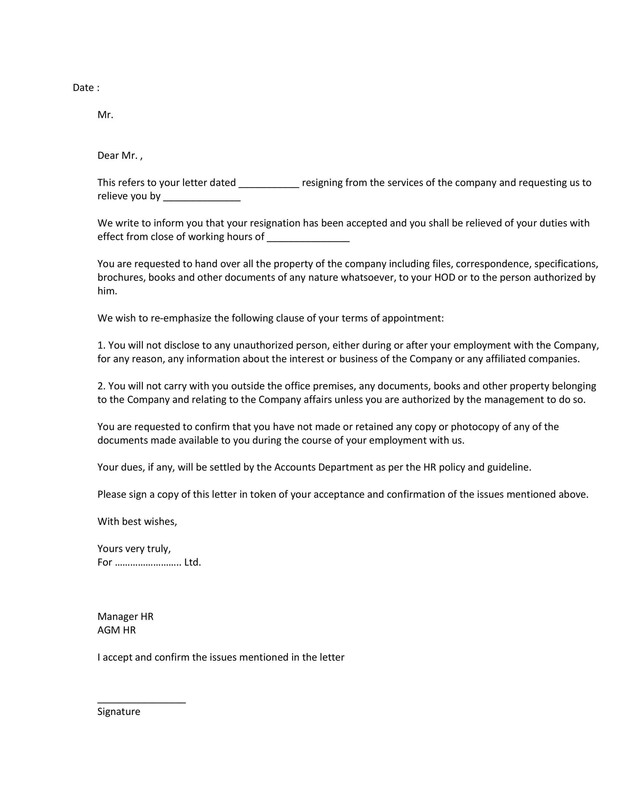 This is another important piece of information to include in the letter, especially when a dispute arises regarding when the employee received the document. So as you write the letter, include the exact day, month, and year to avoid confusion. 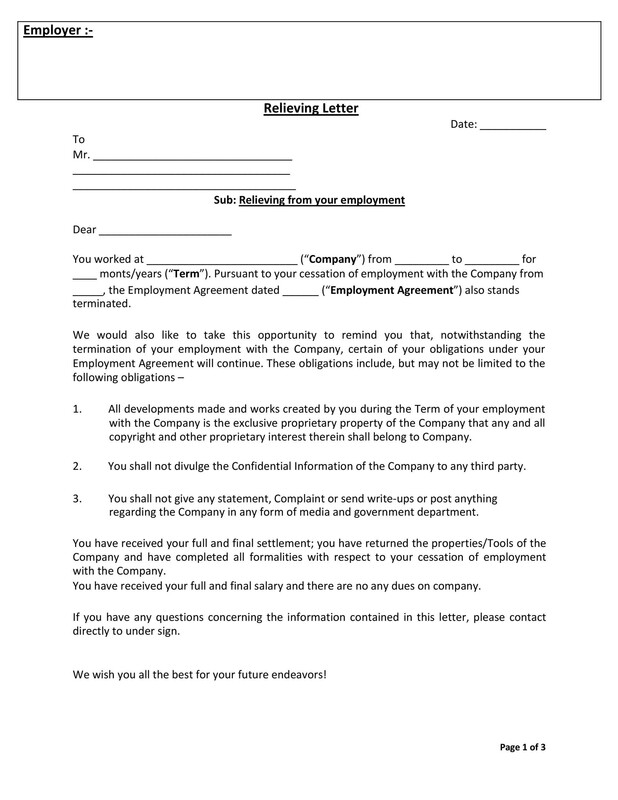 For this part, you may include any information which you feel has relevance such as all of the responsibilities of the employee or all the contributions he has made throughout his entire employment. Such information will have a huge effect on whether or not the employee will get hired at the next company. This information will inform any potential employers that the employee isn’t associated with his previous company anymore. 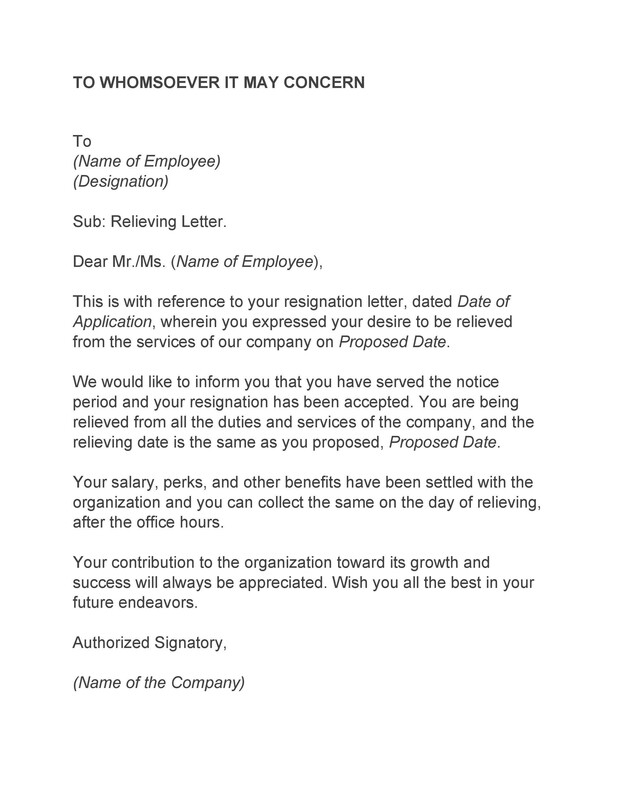 Just like with the date you made the letter, include the exact day, month, and year when the employee resigned from the company. 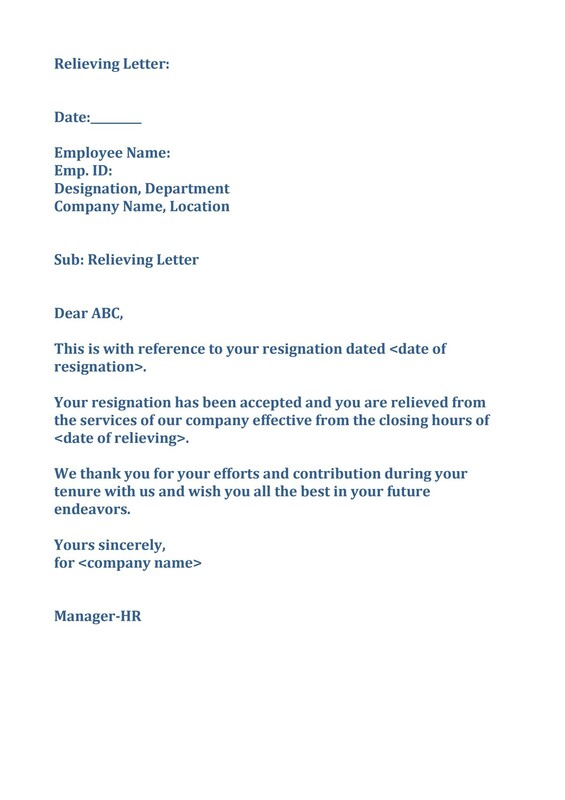 After officially declaring that the employee has resigned from your company and he’s no longer a part of it, it’s time to acknowledge everything that employee has done for the company. To do this, include a statement of appreciation or thanks. This shows the new employer the value of the employee. It also shows that the employee made a good contribution to your company while he was still a part of it. 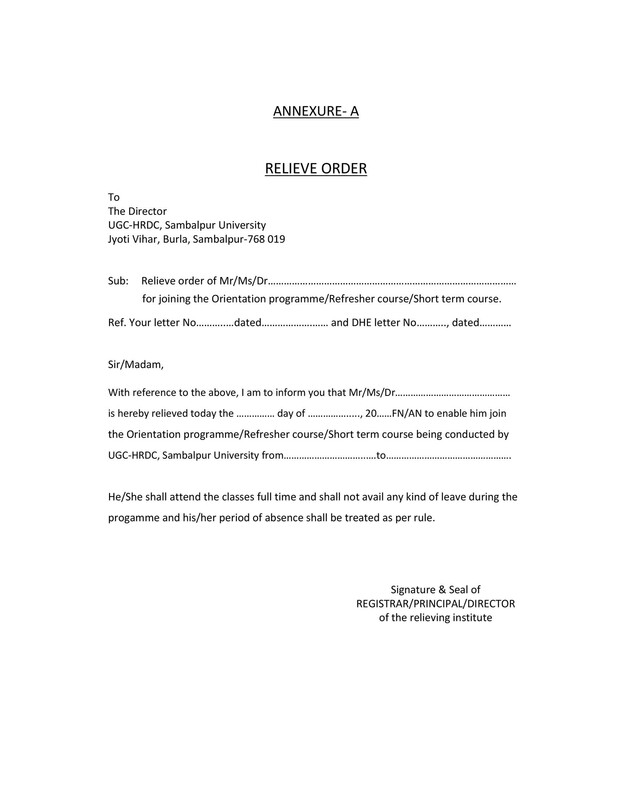 Keep in mind that this is a formal letter so make sure to use polite language when writing this statement. Finally, if you’re the one who wrote the relieving letter, include all this information too. 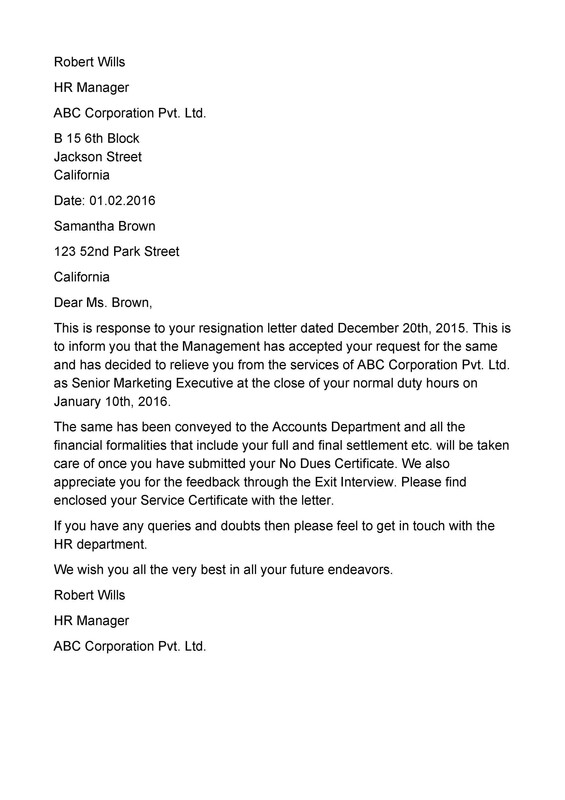 This verifies the authenticity of the letter, especially when the potential employer sees that you hold a high position in the company. 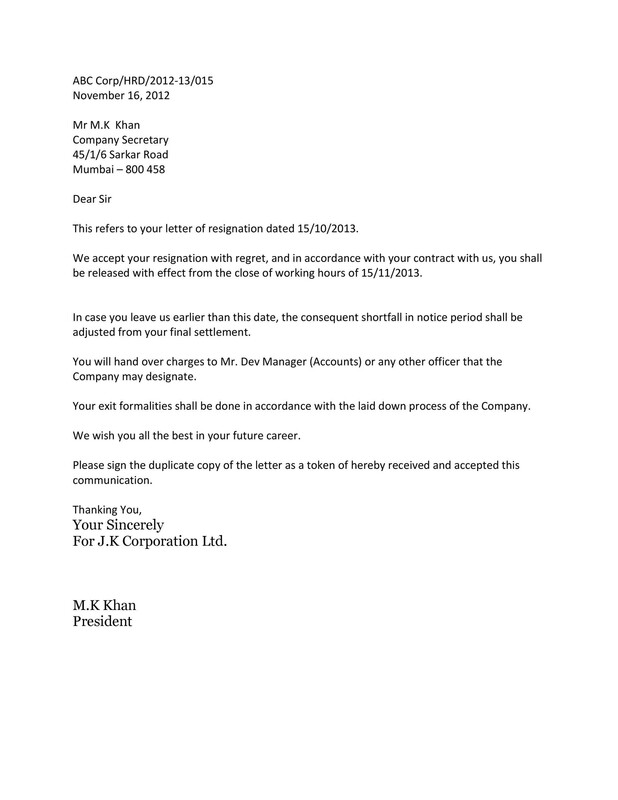 You must only issue this letter under the letterhead of your company to make it official. 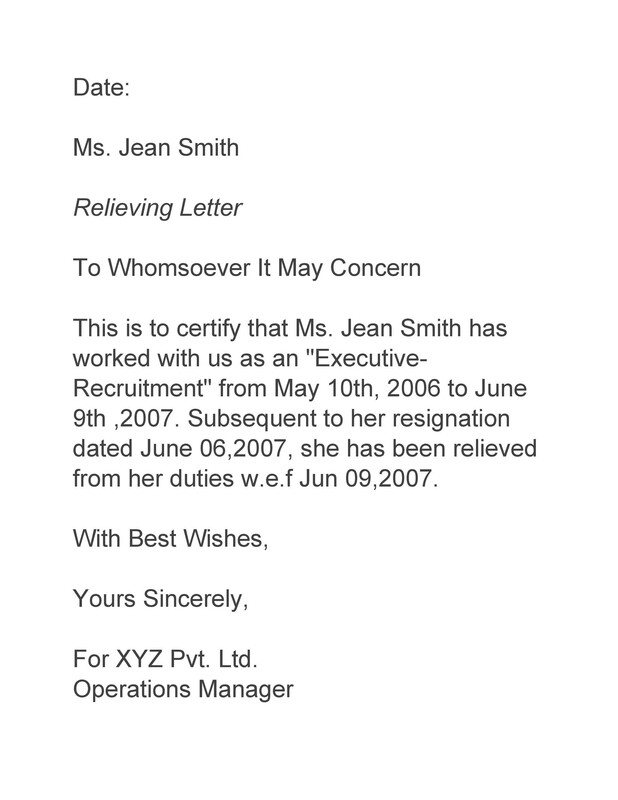 Use the words “To Whomsoever It May Concern” when addressing the letter unless the employee provides you with a specific name. 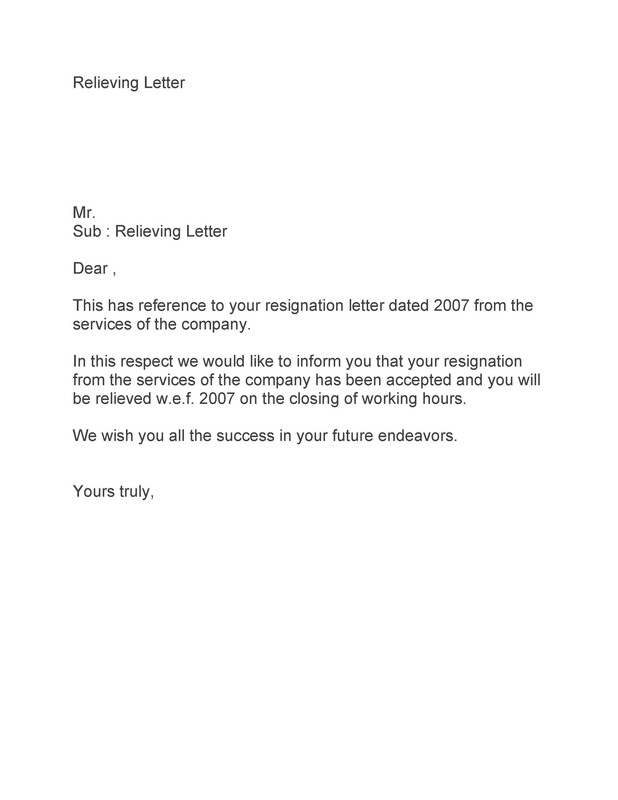 Start the letter by stating that you (the employer) have accepted the employee’s resignation. Mention the most recent position or job title held by the employee. Also, give credit to the employee for all of the great work he has done or all of the major contributions he has made to the company. 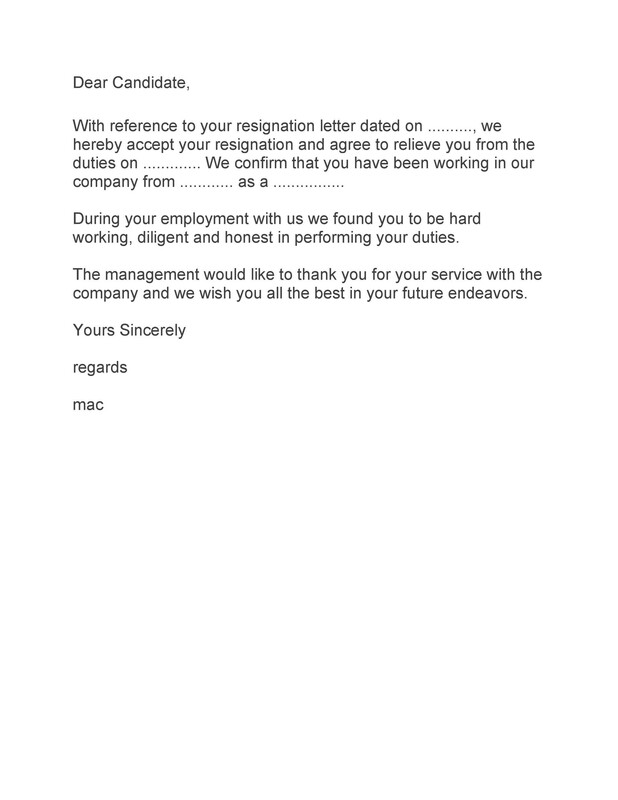 Mention the exact date when the employee joined the company and the exact date he resigned. 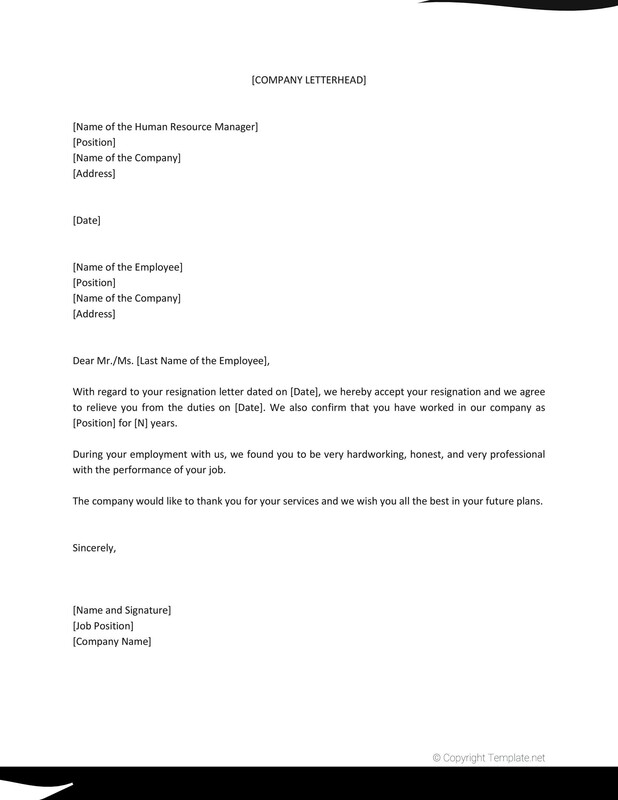 Apart from thanking the employee for all of his services, include a statement where you wish him well for all of his future endeavors. Keep your vocabulary simple yet polite and professional. Also, make sure that you use proficient, polished English in your letter. 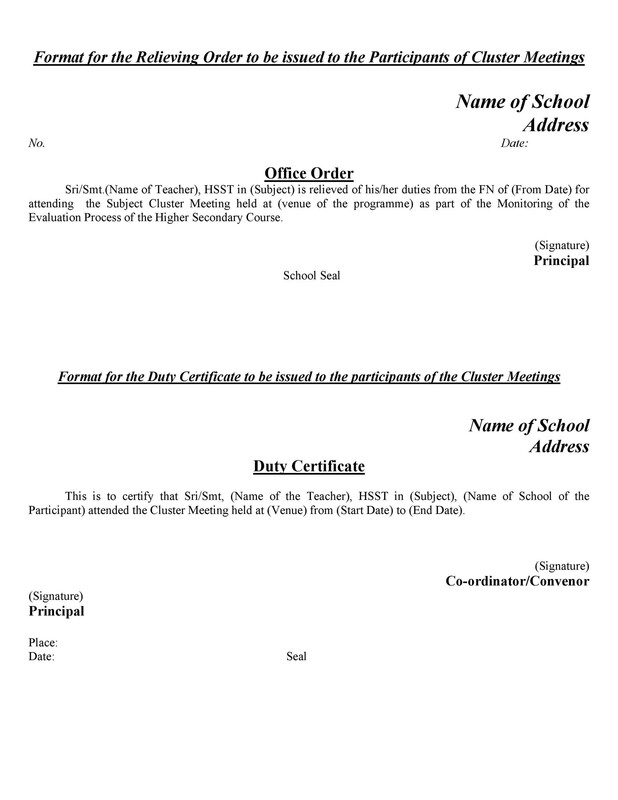 Before printing it out, proofread the whole thing to ensure that there are no spelling or grammatical errors. 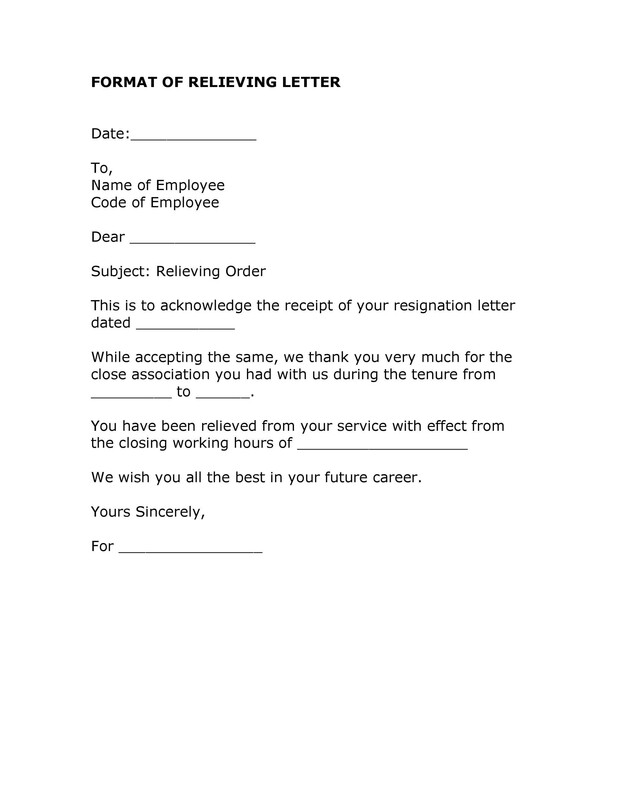 When you hand the letter to the employee, do so in a positive, warm manner. This will make the employee feel positive about the company even though he’s leaving. When should you receive a relieving letter? 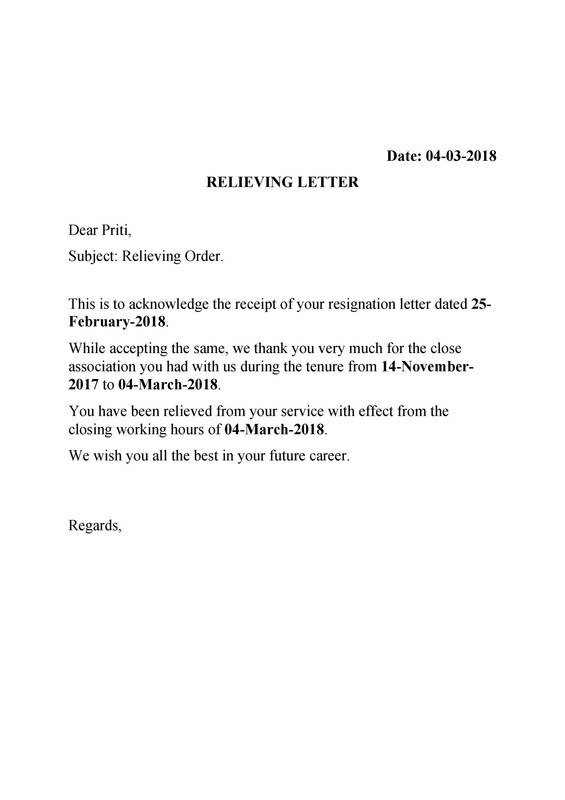 After you resign from a company, you should receive a relieving letter on the same day that they accept your resignation. 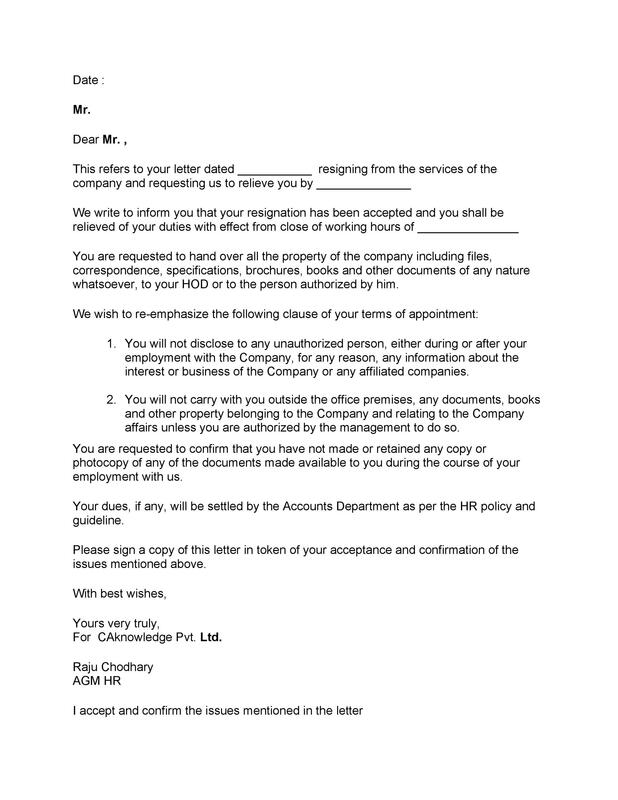 If you don’t receive the letter right away, this might mean that some issues exist which prevent them from creating and issuing the letter. 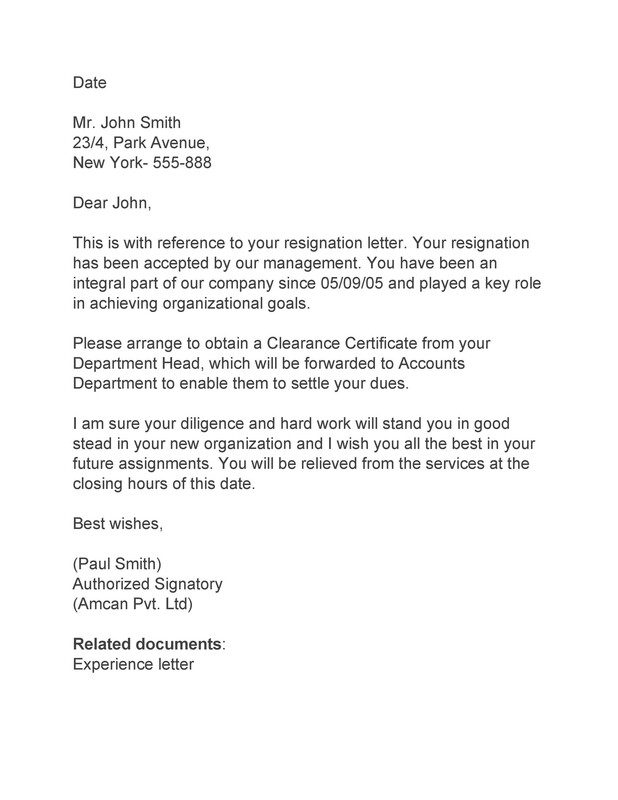 Remember, this letter serves as proof that you’re no longer an employee. Therefore, you must ask for it from the company before you leave. 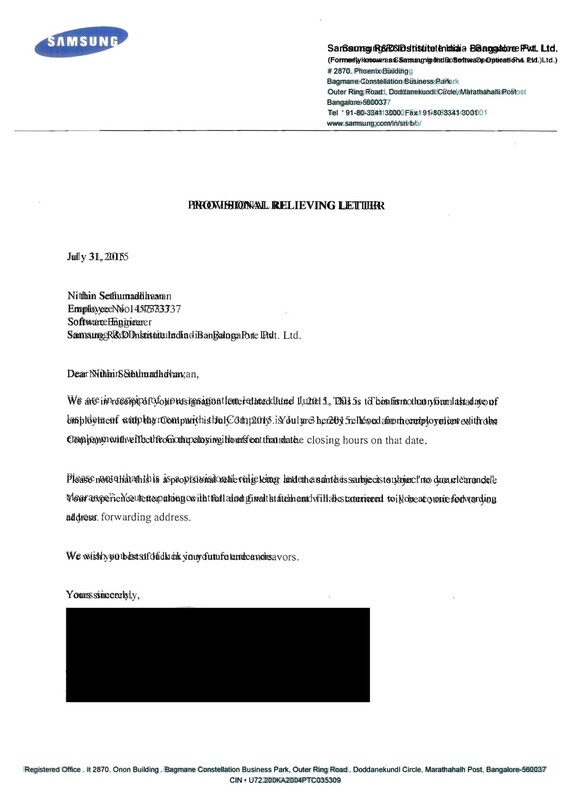 Also, remember that when you apply to another company, they may ask for this letter which is why it’s very important. 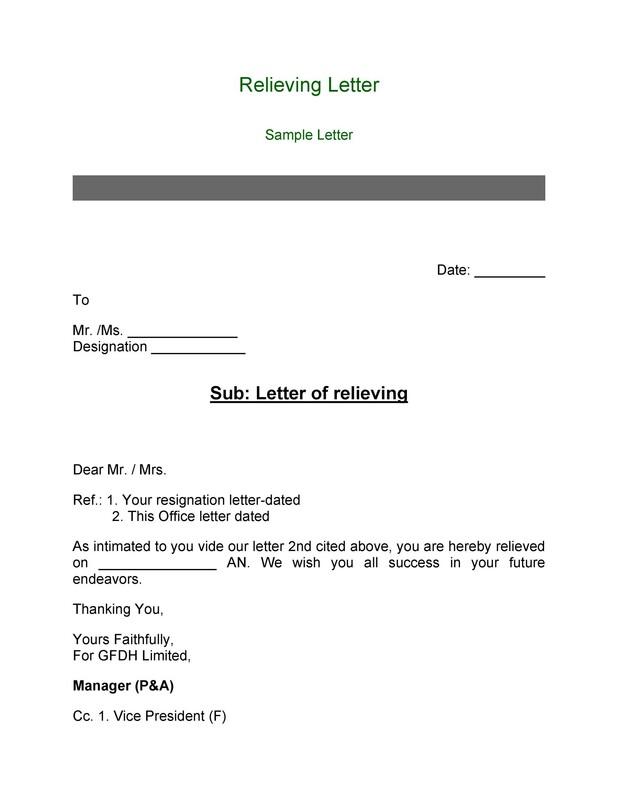 As soon as your employer accepts your resignation, expect the issuance of this letter right away. If it doesn’t come, you may ask them for the reasons for the delay. There’s nothing wrong with asking for this letter, especially when you know how important it is and why you need it. In fact, it’s good to ask in case there is a delay. 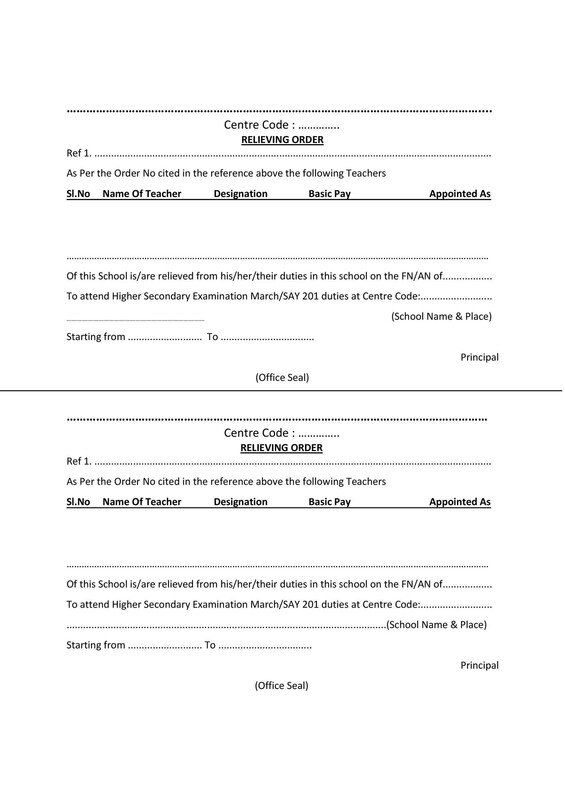 This way, you’ll have an idea of their reasons for not issuing the letter. 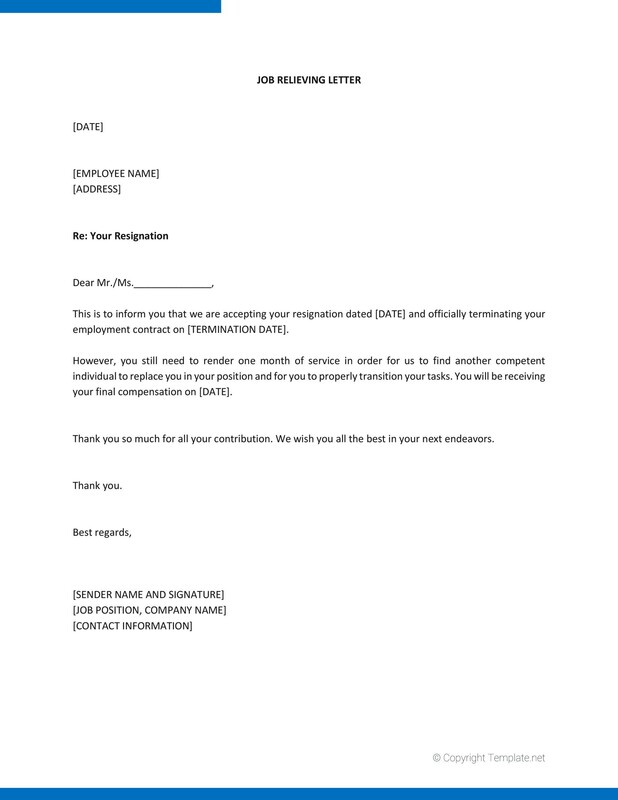 If there’s anything you need to do or any steps you need to take for them to accept your resignation and issue the letter, you can work on these issues as soon as possible. 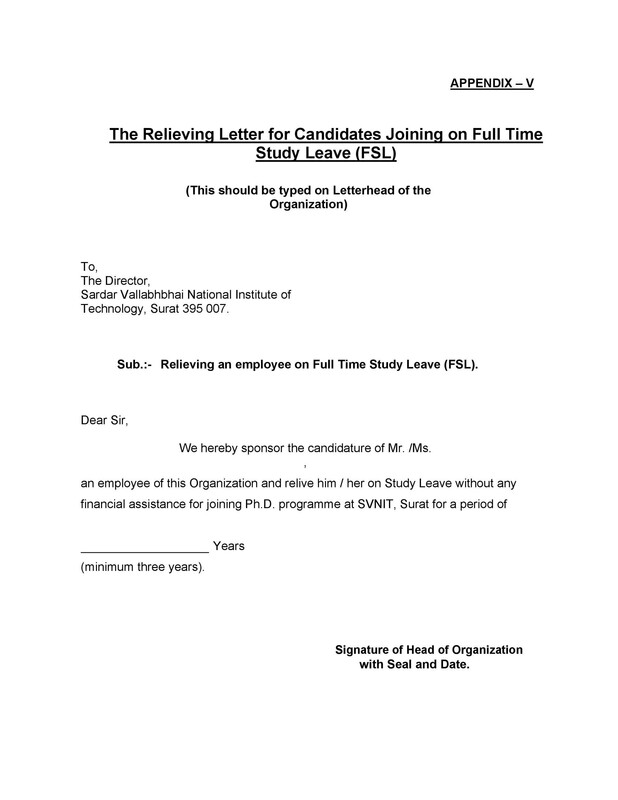 But when you receive the letter in a timely manner, make sure to thank your employer, not just for the letter but for everything you have learned throughout your employment at the company. Thank your employer for all of the good experiences you’ve had while you worked with them. What happens when you don’t receive a relieving letter? 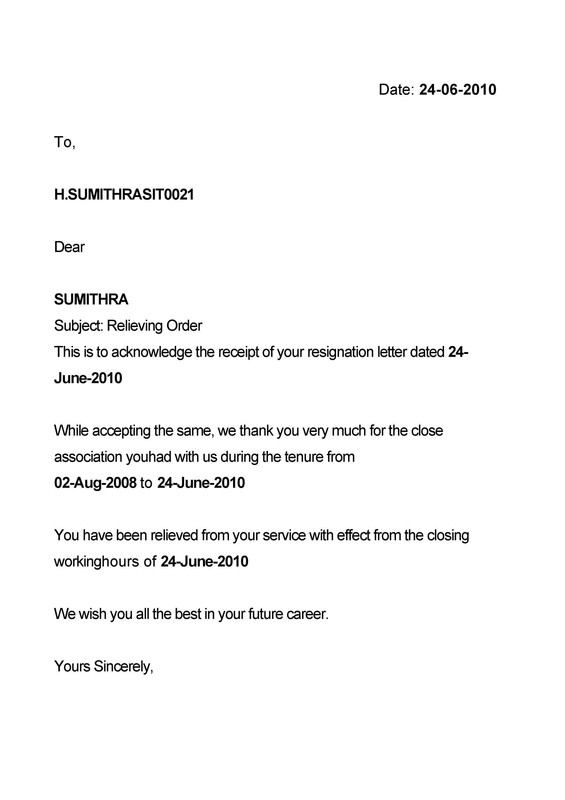 There may be times when you don’t receive this letter even after you’ve given your resignation letter to your employer. 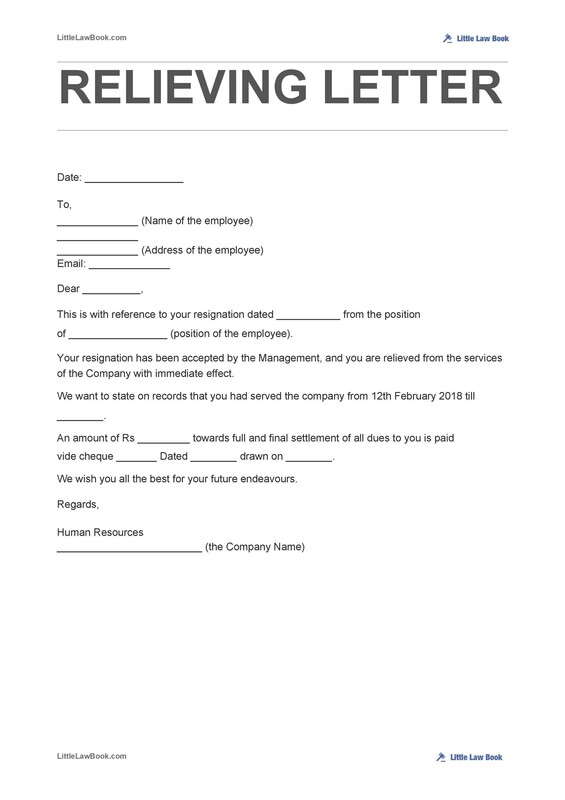 This means that there are some issues with your resignation which need resolution first before you can leave the company. These issues are directly related to you which is why they haven’t accepted your resignation. One possible issue is that there’s an ongoing project in the company which you’re tasked with and only you can handle its complexity. Therefore, the employer wants you to finish the project first before they allow you to go. 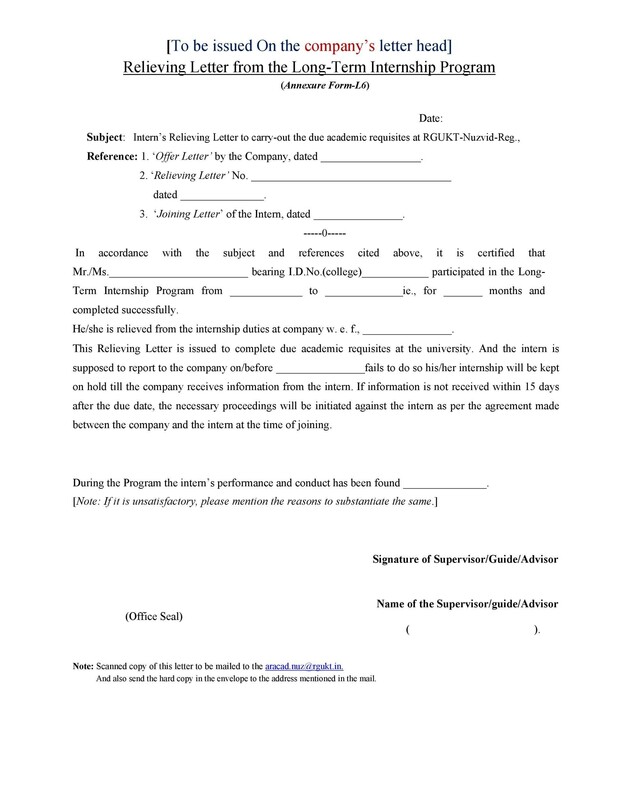 In such a case, you may need to complete the project first before the employer accepts your resignation. This is a common scenario in companies, especially those which have employers with a lot of expert knowledge and skills. Even while they’re working on a project, they get hired by another company which offers better benefits and this pushes them to resign from their current company. 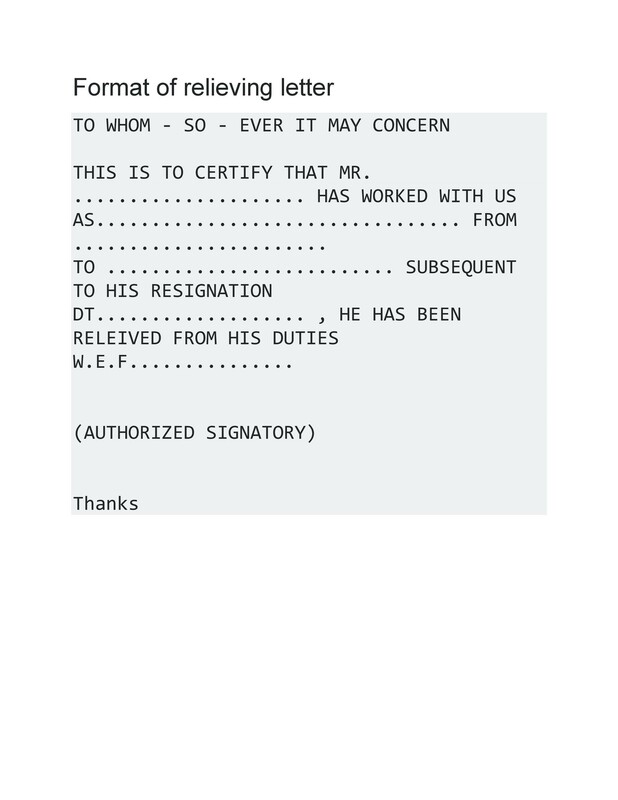 Of course, this isn’t the only situation which prevents your employer from issuing you a relieving letter. For instance, if there are documents which you haven’t filled out yet or those which you haven’t submitted yet, your employer won’t accept your resignation yet. The bottom line is, if you’re planning to resign, make sure that you’ve accomplished all of your tasks and you don’t have any pending work. That way, when you give your resignation, they won’t have a reason not to accept it. That is unless they don’t want to let you go!